Whether you are going for a sleek, classic, modern, vintage, soft or romantic wedding, there is a colour scheme to suit every bride in 2019. Choosing that ideal venue and choosing how to dress and decorate are some of the first and most important decisions that a bride will make. Choosing that perfect shade to bring your venue to life is one of the most important choices that will set the tone for the entire celebrations; not forgetting adding your personalities to the décor and theming which will make the day even more special. Coral is the colour of the season for that more blushing bride. It is perfect for a spring or summer wedding but also when mixing with deep reds and dark orange for that more autumn/ wintery look. Bridal designers have been inspired by tropical sunsets and warm summer evenings. One of the most popular colours to choose are the neutrals for that timeless and simple look. Ideal for the more rustic of venues, you can use the entire palate of neutral colours to really bring this theme to life. Why not consider mixing different shades of grey with black and white for a more contemporary look? Blush pink is still a firm favourite when wanting to create that soft and romantic look. 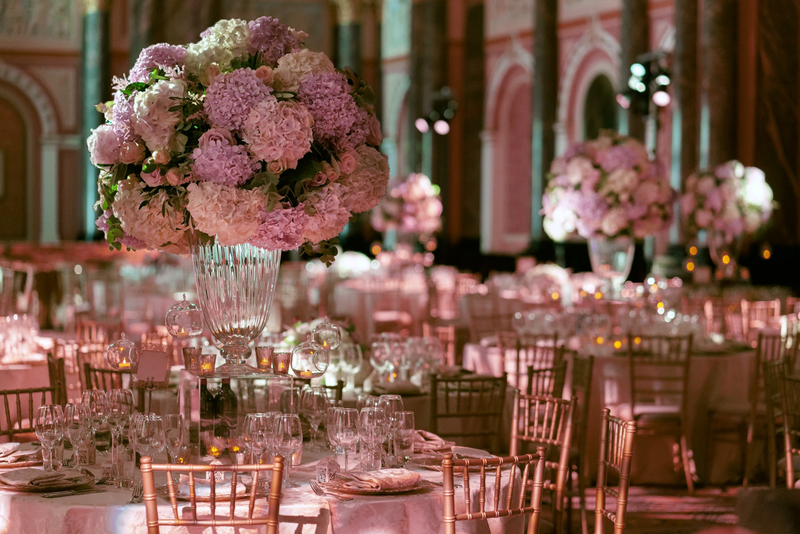 When picking this colour, you can really go to town on your floral centrepieces and bridal bouquet, choosing flowers as elaborate as you would like to help create that fairytale setting. Our favourite and possibly the most daring colour theme would be metallic. If you are looking to create a glamorous and chic setting, then why not consider soft rose gold or striking silver? It is the small details that will bring your theme to life, so why not consider sparkles on your dress, small metallic touches to the bridal outfits, silver writing on your wedding stationery and hints of metallic on your floral centrepieces?